Last year I bought my first raskog cart (I know, what took me so long??) Before then, I loved to pin all of the many ways people use them within their homes (and businesses). Did you know that there is even a Facebook group dedicated to the raskog?? I was so excited to find it (and so many wonderful people that let me share their creations with you). When coming up with a list of the best ideas for my blog, I learned a few things. First, I learned that cats and dogs love to use the raskog as a bed. Second, people love to take pictures of themselves putting the cart together or buying it in the store. I’m not exactly sure why everyone wants to show the world themselves modeling next to the cart, but it appears to be a popular IG photo op. Lastly, I learned that the possibilities are endless when it comes to using the raskog. You can find a way to use it in every room of the house. Now, if you don’t live near an Ikea, don’t fret. They sell various versions of the 3-tier cart everywhere. Michaels, Target, and more all carry their own version. If you can’t get to a store that has them, Amazon has them as well. This one is my favorite – I love its unique design. 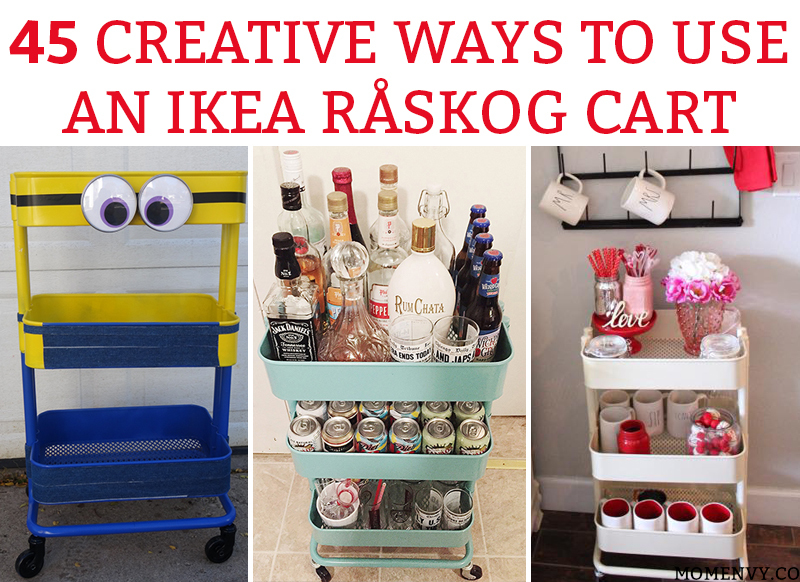 Have you used a raskog or three-tier cart in a creative way? I’d love to see it (and add it to my list!) Now let’s get organized! Isn’t he adorable? Lisa calls her adorable cart creation, Dexter. He would look great in any creative space, kid’s room, or playroom. His eyes are IKEA magnetic spice containers, the goggles strap is electrical tape, and the denim is sticky backed denim ribbon – how inventive. Suzannah’s Rae Dunn collection is impressive. The Raskog is a great way to display your Rae Dunn. Plus, this shows just how easy it is to set up a holiday-themed raskog – you could change it out each season with just a little decor. 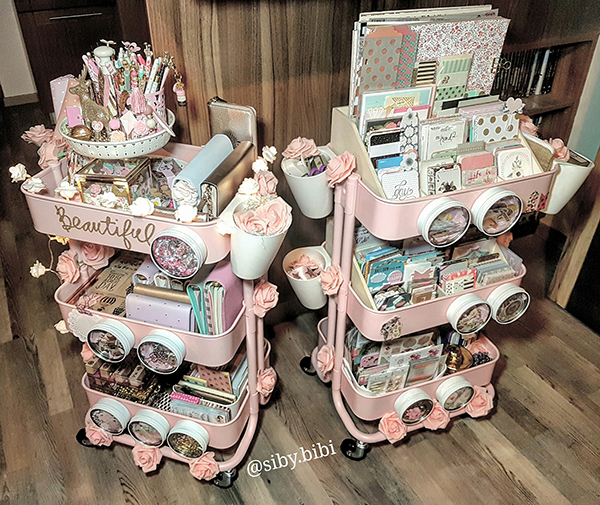 Could these planner/craft carts get any cuter? I love the colors and how well organized they are. It shows how you can add various containers to make the cart more functional. Lunches would be a breeze with this convenient cart. It has storage bags, paper bags, silverware, snacks, drinks, and even a pen. You could even print out some free lunchbox notes and place them in the container with the pen. I love that she used vinyl to decorate her cart including a reminder to add fruits and vegetables (which are kept separately from the cart). Keep your fluffies organized using this simple set up from Missy. It makes it super easy to pick out which one you want and also gives you a great idea of when it’s time to do some laundry. Isn’t this one of the cutest and most thoughtful baby gifts? 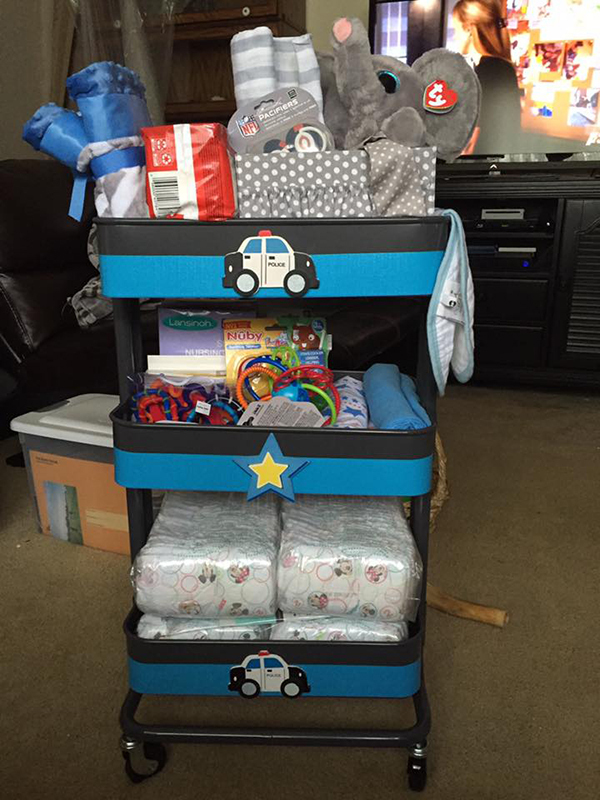 I would have loved to have received a Raskog cart full of baby must-haves! I love seeing the Raskog used for bar carts. 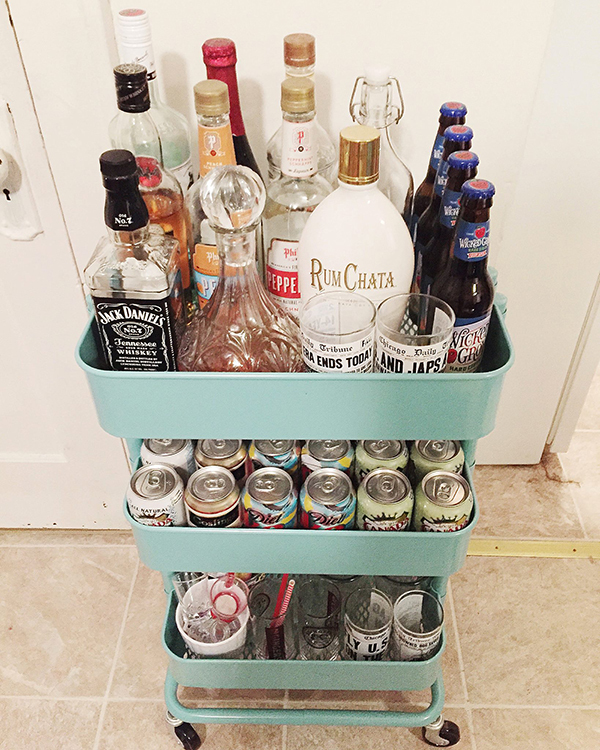 I think it’s such a great use of the three-tiered cart. My favorite part is that because it’s on wheels, you can move it around as needed and store it someplace safe if you have kids. Coffee stations can be a great feature in any kitchen but it can be so hard to give up valuable counter space. Using a raskog will definitely help you save on counter space – plus you can move it to a different location for entertaining! Looking for an easy way to store your classroom supplies? 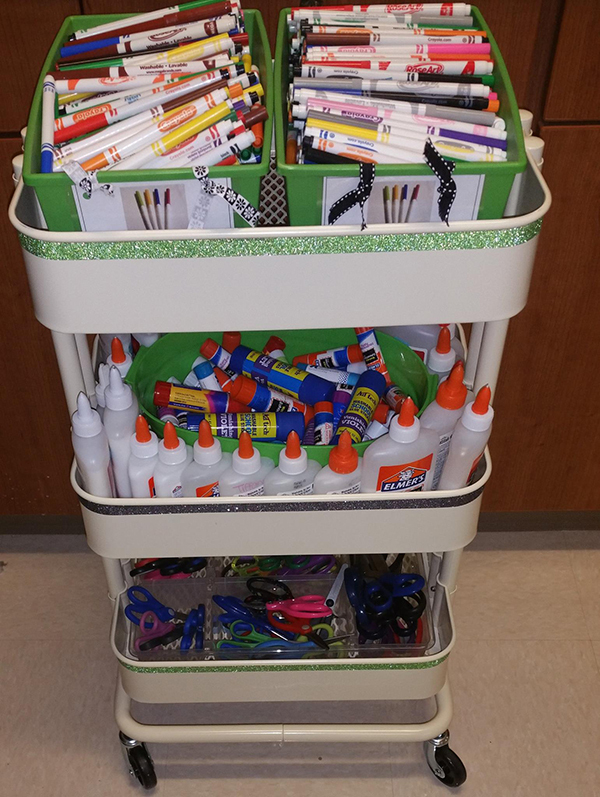 This cart could make such a difference for classroom organization. 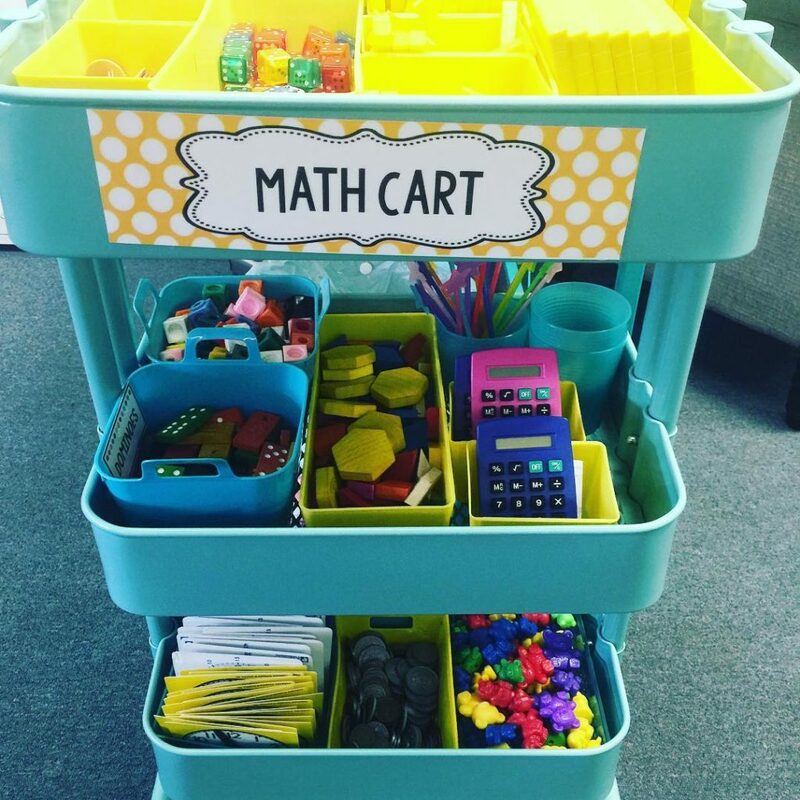 The students can easily access supplies, they can be moved around as needed, and you can adjust the cart to meet your classroom’s needs (mine would have been filled with a whole lot of pencils). 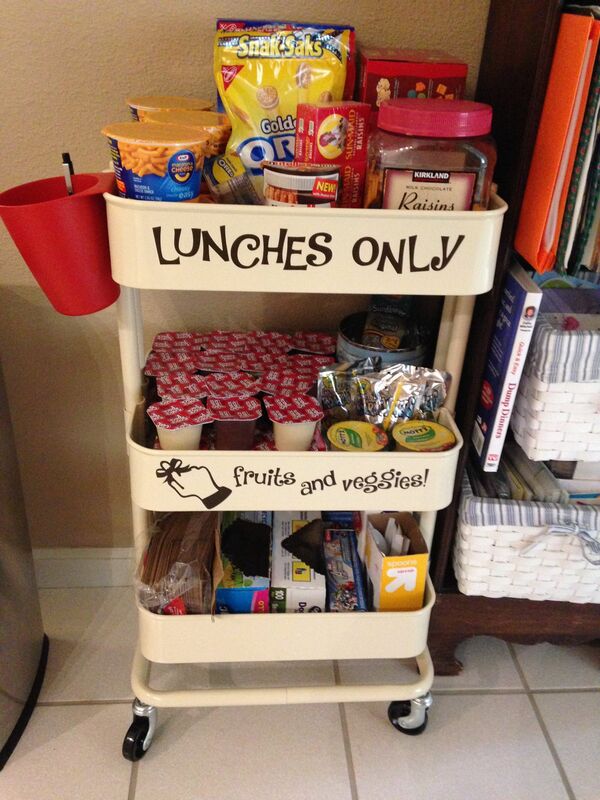 I love this second version of a lunchbox cart. I love that there is a special pocket especially for lunchbox notes. 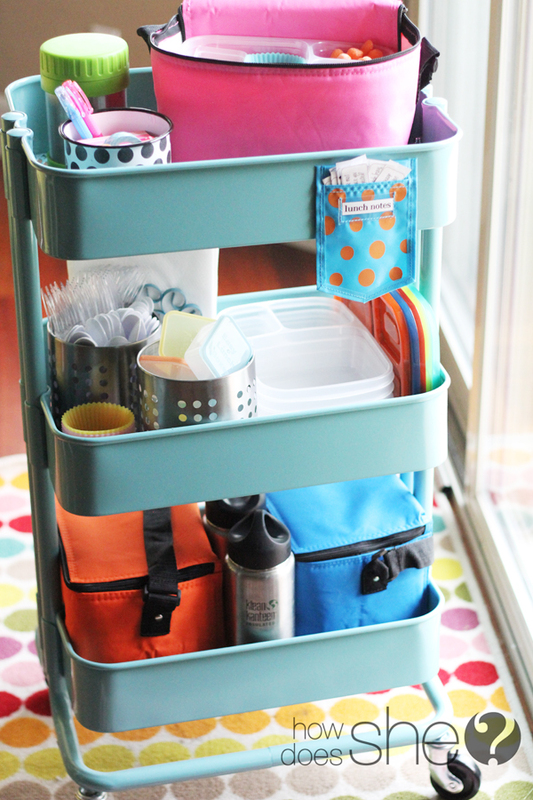 Missy is able to store multiple lunchboxes, storage containers, silverware, and more. 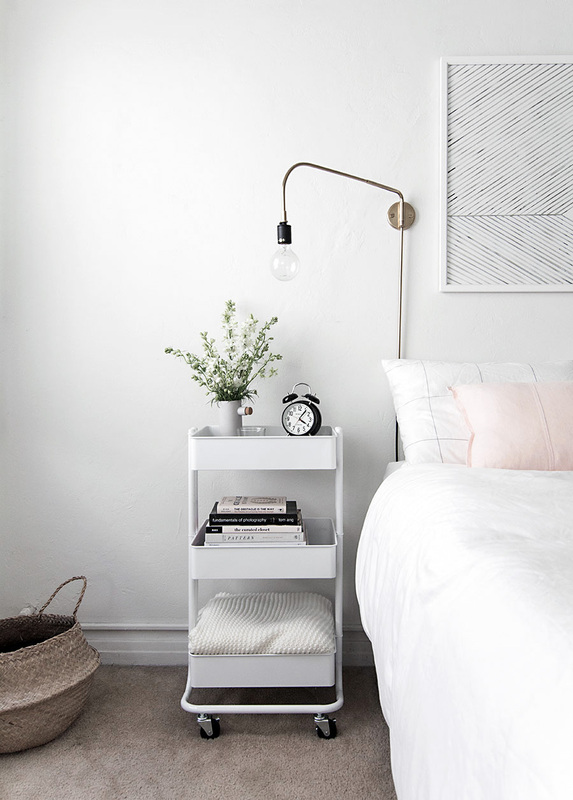 When I heard people used a Raskog as a nightstand, I was skeptical. When I saw Homey Oh My’s version, I realized just how wrong I was. Amy keeps the storage minimal which keeps it from looking cluttered or disorganized. 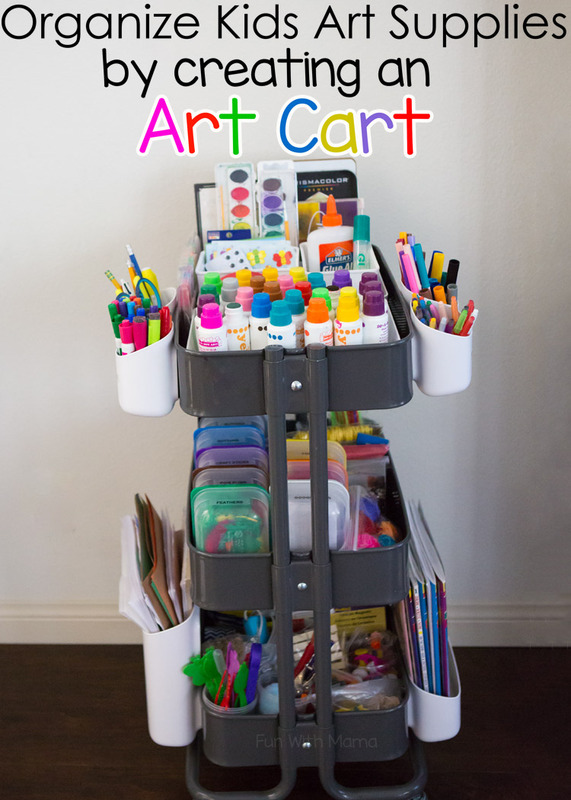 This art cart would be perfect for a playroom, kid’s space, or classroom. The containers hanging off the side allow for even more storage. 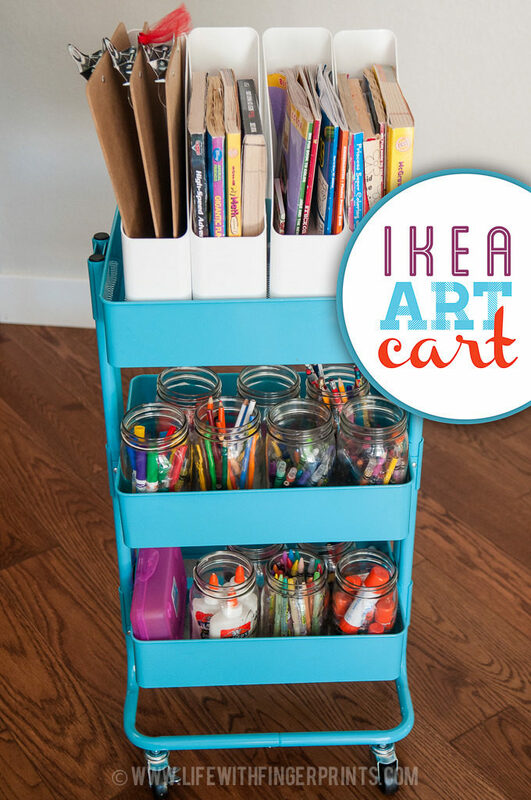 This is another way to use a raskog as an art cart but it is such a different take. 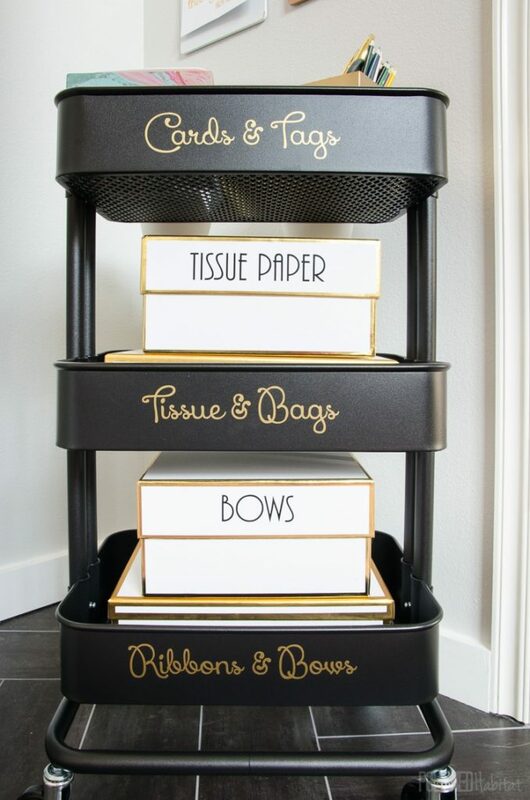 Click here to check out where Kara got her magazine holders to make this neatly organized cart. Using a raskog in a bathroom is so smart – especially if your bathroom is tight on storage. 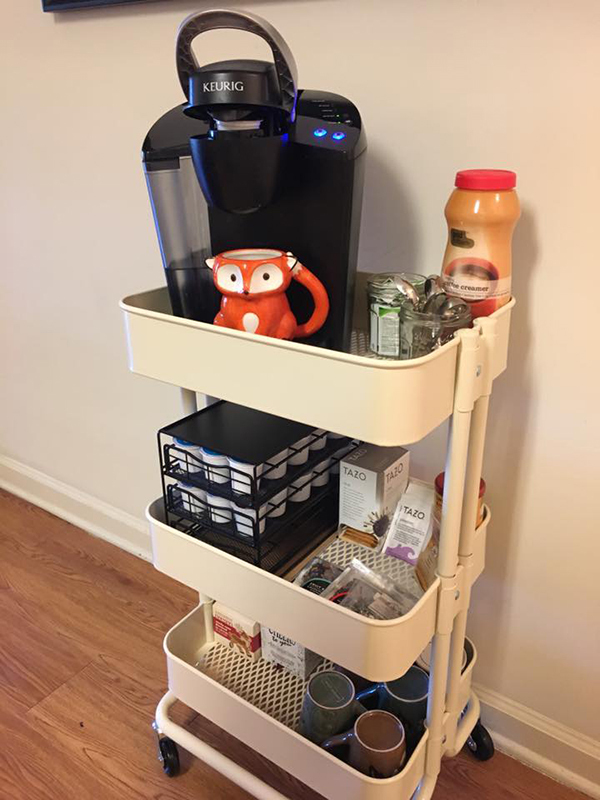 If you’re in a rental and can’t put up any additional shelving or cabinetry, this cart would be a great solution. This cart full of succulents is so beautiful. It would really work out well at an event like a baby shower, to hold all of the favors for the guests or as decor. Laura spraypainted her carts to make them even more magical looking. They perfectly coordinate with all of her crafting gear. Click here to get all of the behind scenes info on how she created these beauties. Raskogs make great storage in a kids room. 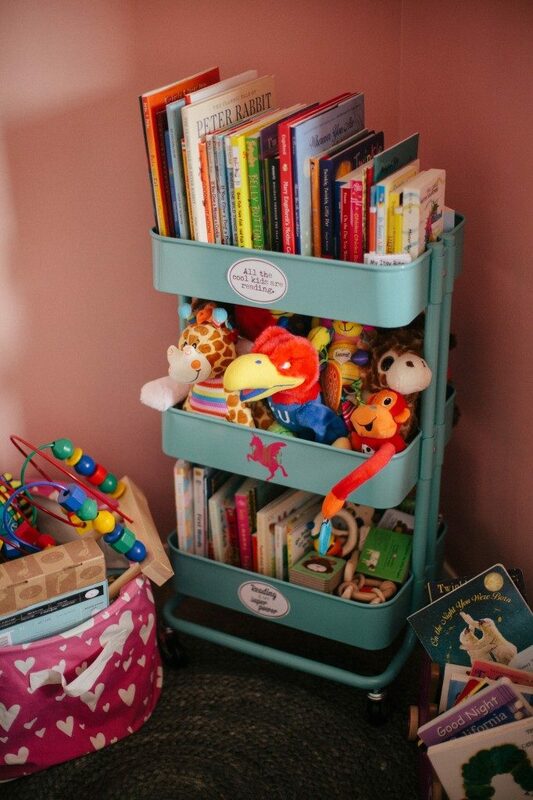 They’re a great height for children to access the toys and books. This has to be one of the more popular images I have seen for how to use a raskog. This vanity cart is unbelievable – how smart is that metal container hanging off of it for the straightener/curling irons?? Raskogs just aren’t great for toy storage, they can also hold baby supplies. When you’re dealing with a fussy baby, you want their supplies to easy to get to. There’s no need to riffle through a drawer when you use a raskog. Seriously? 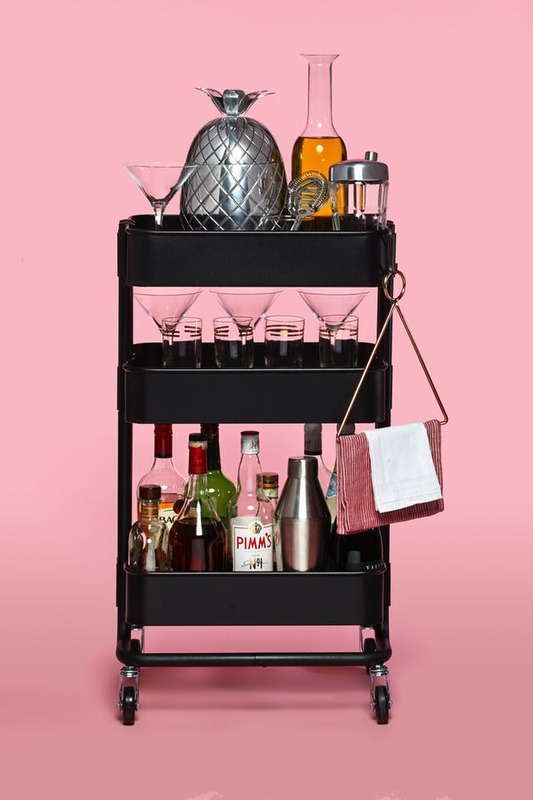 Who knew a raskog could make such a chic bar cart. They have some great tips on how to create your own here. 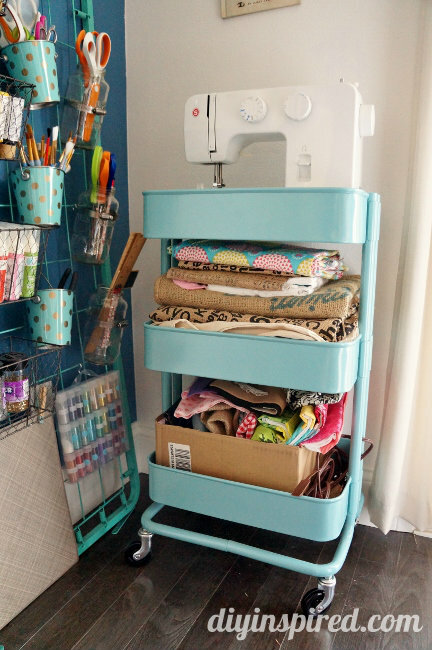 What a smart solution for storing a sewing machine, fabric, and scraps. No need to liff the machine down from a top shelf or off the ground – it’s right at table height making it much easier to move back and forth as needed to a table. This would make holiday baking so much easier! I love the measuring cups hanging off the cart. This is another great way to use a Raskog in a classroom. It holds math tools perfectly – from counters to calculators to tangrams. Everything you need is right within reach. This would really be great for a teacher that has centers or does small group lessons in math. We’ve seen basic baby supplies, cloth diapers, and toy storage. This cart makes diapering so much easier. I love that you could easily see when you’re running low on diapers or wipes. 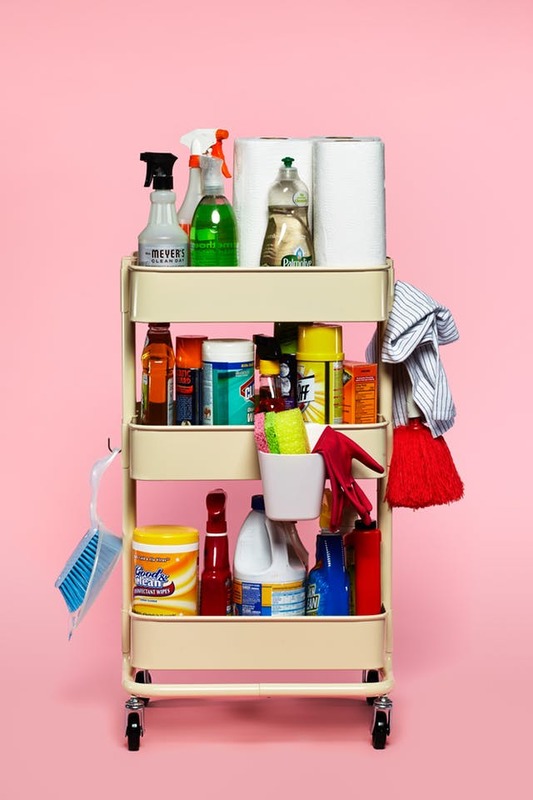 The Kitchn sure knows how to use a raskog to get organized. 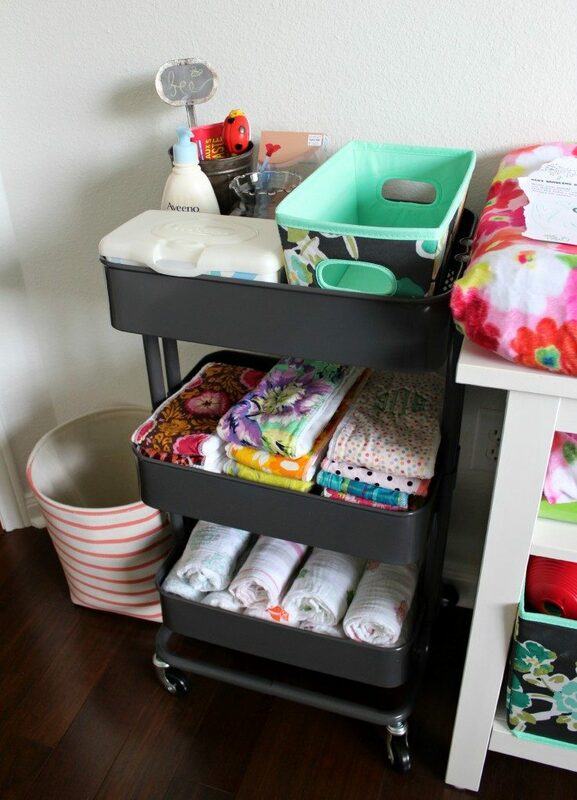 This cleaning cart would be perfect for a pantry, laundry room, or at a place of business. I have to admit, this is my favorite cart in the bunch. I dream of my gift wrap being this organized. A portable iron station would be a dream for those in the sewing world. I love how easily it holds supplies underneath. How smart is this?? They flipped the top shelf the cart over to make a tabletop for a laptop. This would work so well in a small space or a house without an office space. 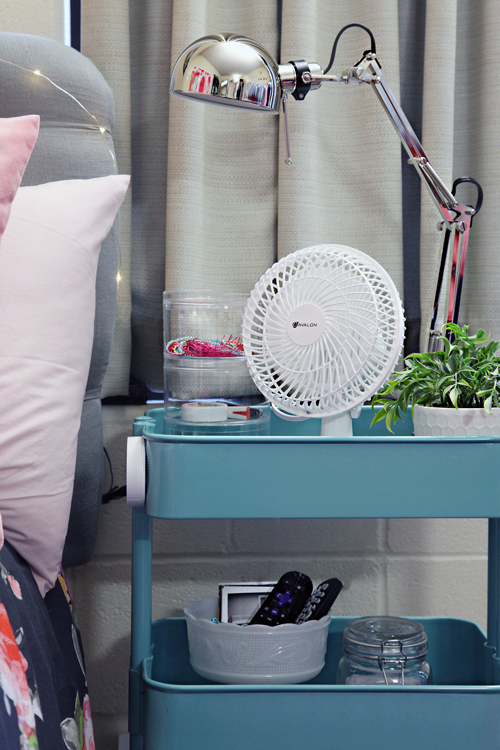 Dorms can be tricky to decorate. You have such a small space and it would be great if every piece could be stylish. This cart works perfectly in the space. Where are all of my entrepreneurs and ETSY sellers? How amazing is this shipping station?? What a fun way to store gaming systems. It can hold not just systems, but games and accessories, too! Using a raskog to hold produce is a great use of the cart. Make sure to put your cart in an environment that meets the fruit or vegetable’s needs (such as putting it in a cool, dry place for potatoes). What a smart idea! The raskog really holds up to holding this gym equipment. It really proves how durable this cart can be. 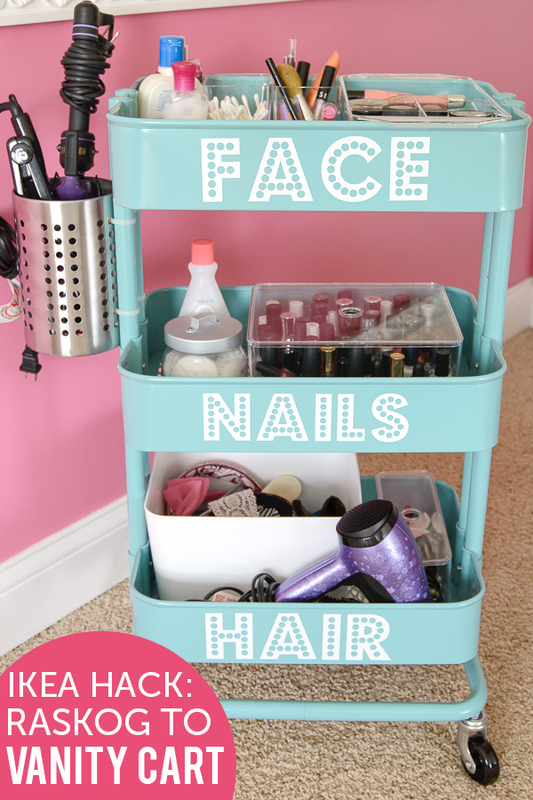 Stephanie does it again with this makeup and nail polish storage cart. She uses some great small containers to keep everything neat and orderly. 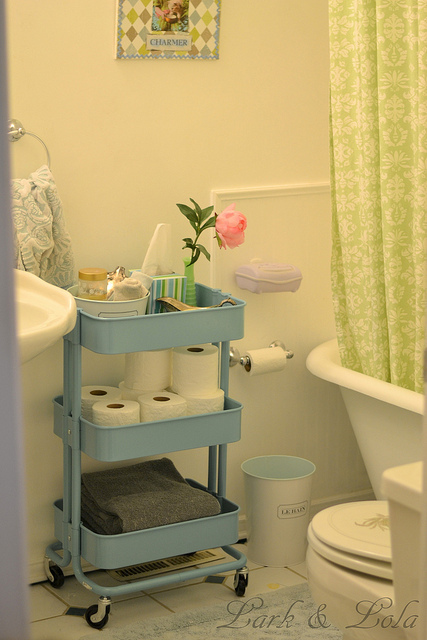 I love how Melanie makes use of her cart in the bathroom for storage. Plus, she added some plants to liven up the space a bit. 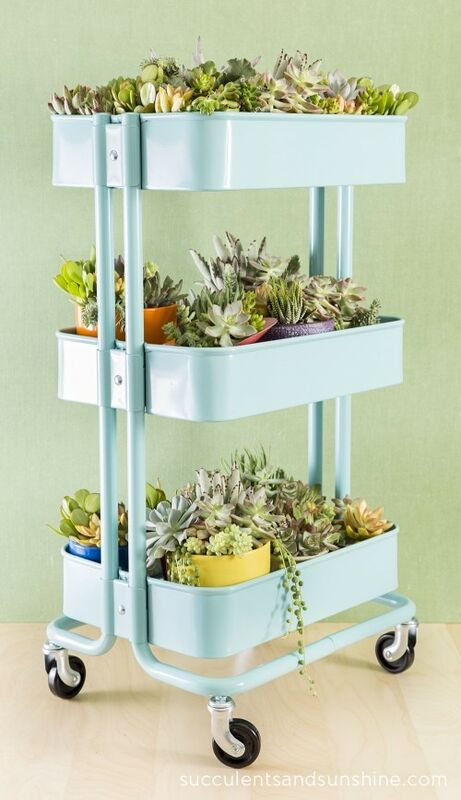 Melanie’s bathroom cart was cute and functional but this plant cart is simply amazing. Who knew it could look so pretty filled with plants and flowers? 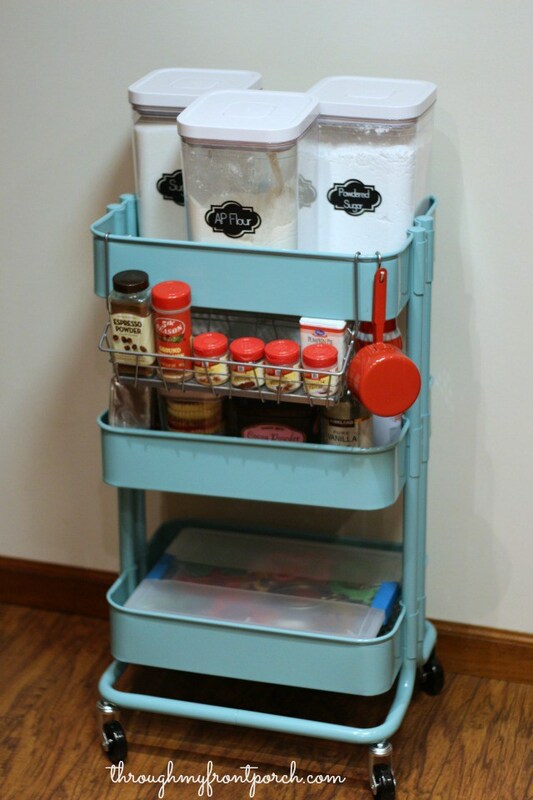 I love the idea of this simple pantry cart. Often times pantry have some additional floor space that goes wasted. This way, you can get a little more storage in a pantry but have the ability to move it around to still get to everything. Jessi uses her raskog like a bookshelf. 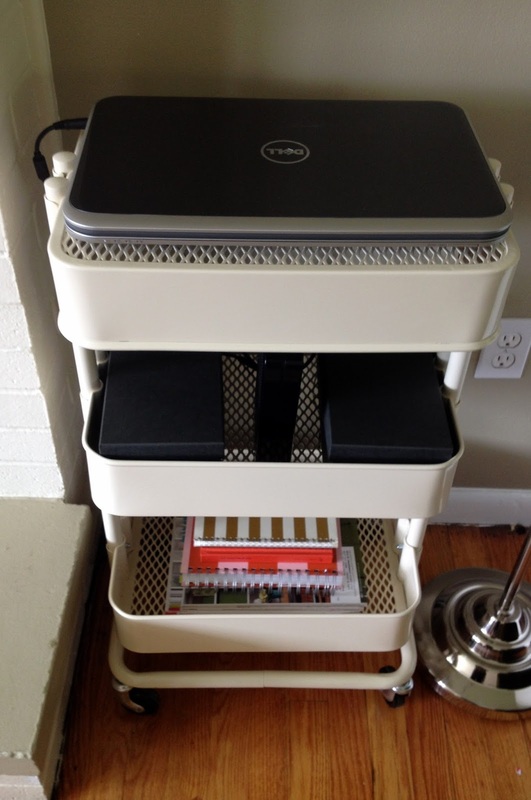 It’s an inexpensive way to store your books – it would be great for any apartment or dorm. This cart is so simply organized with bath and beauty supplies. It really shows how versitile this cart is in both what it can store and in how it can be styled. 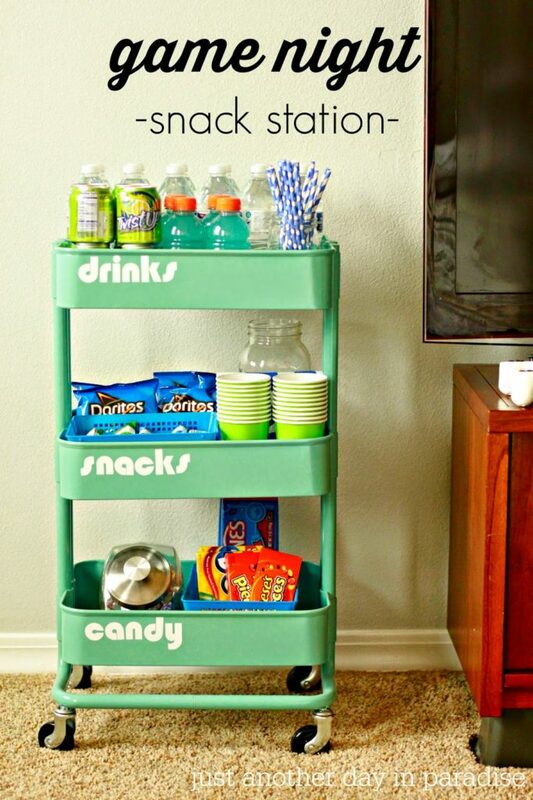 This is the ultimate snack cart perfect for a game night or party. You could easily switch out the snacks to match your menu. Believe it or not, this is a mini raskog cart. Target sells a doll set that comes with this cart – it makes such a cute desk organizer. If you have lots of smaller paint cans (think chalk paint, wax, stain, etc.) then this rakog cart idea may come in handy. Do you work with a lot of paint? 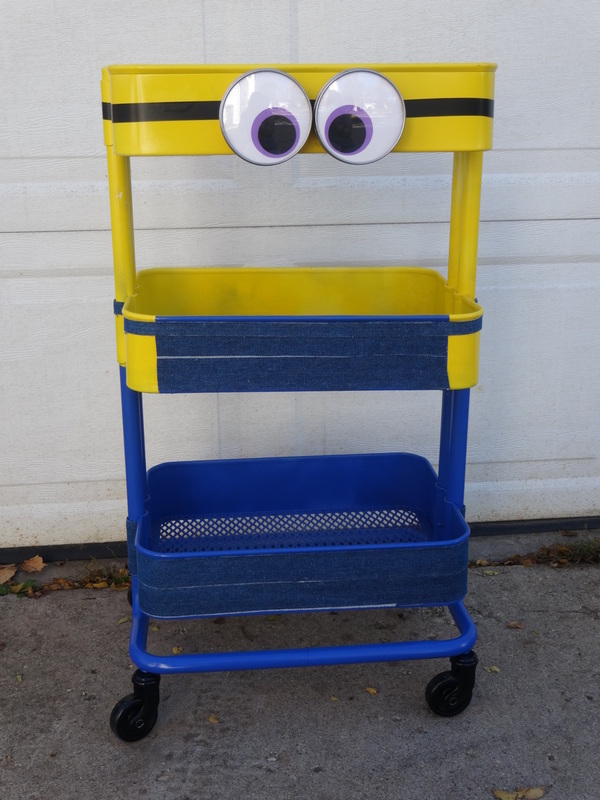 This cart holds paint and crafting supplies perfectly. Rachel will have no trouble finding the right paint color because she turned them all upside down. The raskog doesn’t have to only be about storage. 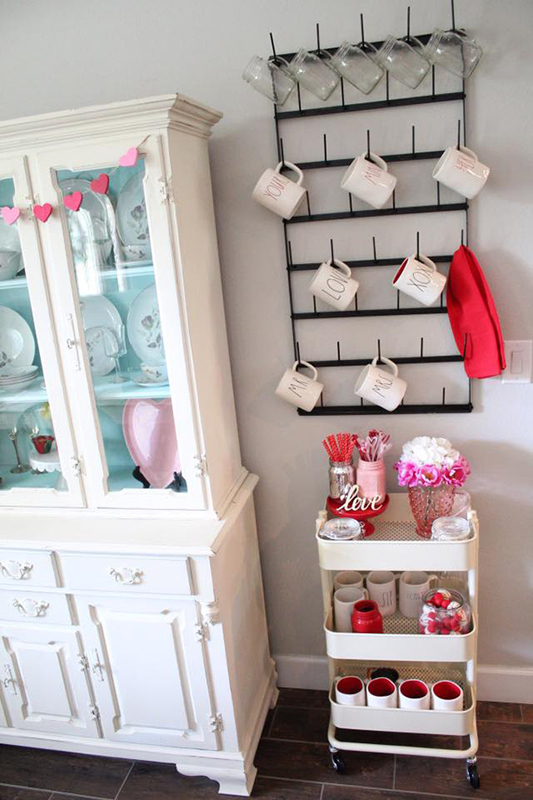 It also makes an adorable display space for decor. I love how Monica used a standing file holder on the top of her cart. It would work well for mail or for filing. Hi Laura! 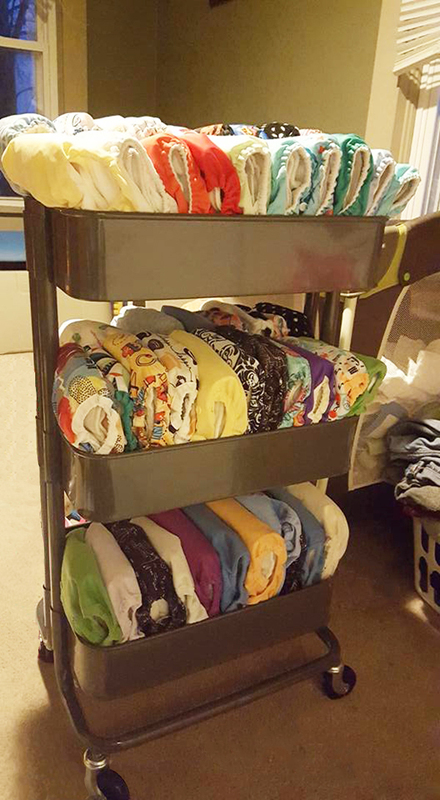 I just wanted to let you know that you I reorganized my daughter’s closet and implemented your tips on using the Ikea cart! 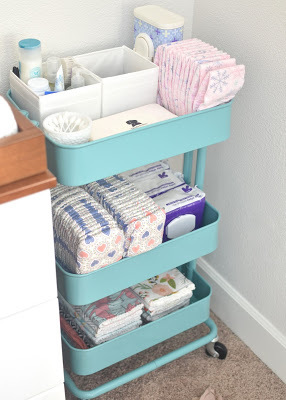 I purchased the raskog cart and not use it for my daughter’s socks, diapers, and accessory station. It’s amazing how much space the cart saves and how cute it looks. 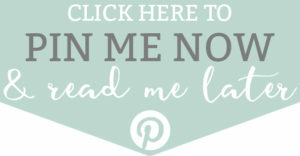 I actually just started my own mom blog and you’ve inspired me to do a post on nursery organization as well! Thank you for all of your tips and tricks!